I want it to be known up front that I really did expect to like this. I have nothing against feel-good Oscar bait movies. I have nothing against any "type" of movie. But I cannot abide bad filmmaking, and if you're going to abandon the concept of making directorial choices, you'd better have something else up your sleeve. And to be fair, The King's Speech has quite a bit up its sleeve, most notably two rather fine leading performances in Colin Firth and Geoffrey Rush. Both have received considerable attention as Oscar contenders, which is deserved in a sort of "well, they don't NOT deserve it" kinds of way, and these things being so predictable, it's difficult to imagine either of them being left out at this stage of the game. 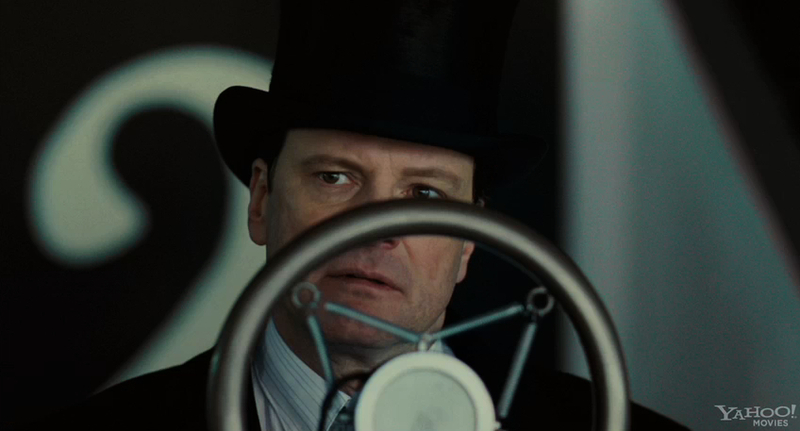 Firth plays King George VI, who, upon a sudden ascendence to the throne, redoubles his effort to rid himself of a lifelong struggle with his stammer, an affliction that manifests less like Porky Pig and more like a panic attack. Rush plays his speech therapist, Lionel Logue. And again, they're both good in their roles without ever quite teetering into greatness. Firth's technical mastery of the stammer is commendable, and he has one scene to get at the soul of King George (or "Bertie," as he's know to those closest to him) in which he completely delivers, but this is far from his magnificent turn in last year's A Single Man. Rush is given the fun work as the unorthodox, learned-it-on-the-streets speech therapist who gets to break down all the pomp and circumstance surrounding Bertie, and bring him down to merely a man. This type - the man on the streets who shatters the illusion of class superiority - is always a crowd favorite, and Rush plays it with relish. But aside from being a delight in most of these scenes, Rush isn't given much to work with, so any talk of the Oscar will inevitably feel overblown even though he is quite good given the circumstances. The screenplay, by David Seidler, more or less navigates tricky grounds well. The dialogue is satisfactory and Seidler makes some strong choices in setting up his characters (contrasting Bertie's inability to deliver a speech with his able willingness to tell his children a bedtime story is a particularly canny move). The film covers a fifteen-year span, and like most films saddled with this task, nobody has any idea how to treat the passage of time. Bertie never changes a bit, and the weight of time is never felt - the whole affair could have lasted a few weeks with some changed title cards and anyone who doesn't know their history would be none the wiser. Granted, nobody in this set-up is well served by director Tom Hooper, who last year delivered fairly solid, if a little excitable, work in The Damned United, but here is completely lost. Aside from obviously being quite good with actors (nobody else has been able to unleash Michael Sheen as well as Hooper did in the aforementioned film), Hooper displays none of the talents one would hope to find in a director. His camerawork and lens choices are big and obvious and glaring. In a film suited to subtlety (Bertie's entire struggle hinges on projecting an image suitable to a king), Hooper uses fish-eye lenses to either increase the size of his rooms or show Bertie in a fishbowl - none are particularly informative or evocative. He rarely employs a two-shot in a film about the relationship between two men, has no method to motivate his blocking in shot/reverse-shot conversation pieces, cuts away from actors during key moments of expression, and, as previously mentioned, is completely incapable of expressing the passage of time. All without purpose. Again...I really, really expected to like it, and I kept cutting it breaks on my way out of the theater. It's been three days since I saw it, and I've run out of excuses for it. It's not a terrible film; it's bolstered by two fine lead performances and a slew of engaging supporting ones (Guy Pearce and Michael Gambon, most notably). But it doesn't bring anything new to the table, and too often detracts from its best elements. limit brain, were throughout this presenting that's capable on encourage our folks victimization brisk wise needs, associated as to boot we have associate payday loan jackson-MS inclination to tend to want watch out for keep a watch on have degree inclination to face live on the point of exhibit that to suit your needs at notwithstanding time some individual facilitate all folks.